I think it’s safe to say that the majority are struggling financially at the moment and, while interesting to read, there’s not much point reviewing top-of-the-range, flagship devices. Especially when probably 90% of the audience aren’t in a position to splash out on such items. 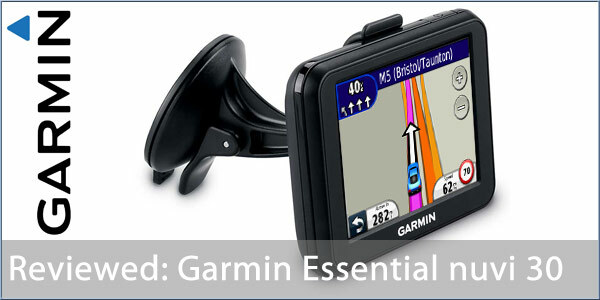 It was for this very reason that we asked Garmin for a nuvi 30 to review - as part of their Essential Range, this is their most basic, entry-level personal navigation device (PND). With an RRP of £79.99 it is certainly more affordable than their £279.99 nuvi 3590LMT. I have a low end Garmin 2300 and find the way it treats POI very frustrating, but the mapping is very good, just used it for a long trip from Gateshead to Chelmsford, found that it very quickly changes the calculated route if you make a small deviation, usually within 10 seconds. on the POI, I have your Speed Camera database installed and although they flash up on the screen, I have been unable to get the speech announcement working. On other installed POI the Garmin treats them badly, if the place is 10 feet off your road it will not display them, I have had to keep my old NAVCON just so that I can see them, (its maps are now four years old and not supported) My local Tesco has its front entrance on the Market place, but the car park entrance is at the back down a side street, if you go past the road to the Market place, it stops navigating and displaying it.. I have been using Tesco in St Austell recently, my one seemed to work OK, perhaps its because I have your Tesco database set up!! Have you put 'sox.exe' file in your POILoader software folder? More than likely as we have the correct location in our database. As this was a review of the device out of the box I felt it needed highlighting that the inbuilt POIs were inaccurate as opposed to ignoring that and using ours for the review. Especially when probably 90% of the audience aren’t in a position to splash out on such items. Known fact, statistic, generalisation or wild guess? my oh my not another garmin..how many more cheap plastic blocky child like graphics pnd's can Garmin make..rubbish routing too.. I've been using one of these for a few months now, and it's a very good device - much better than the predecessor 105. The spoken street names feature is very useful, as most of my journeys are short ones on unfamiliar urban roads. The only real gripe I have with it is that there is no facility to clear the trip log. You can switch it on or off, but can't clear it. Consequently the display near my home/work is full of annoying blue lines. If anyone knows a way to clear it, I'll be very grateful. Good sensible review, thanks , very useful . An error on my part, corrected in the on-line version here. Posted: Mon Aug 27, 2012 8:18 pm Post subject: Review. Garmin Nuvi 30. Good review, but I am confused because you say the nuvi 30 reviewed by you has the latest Garmin mapping (2012.10) which according to gpsreview.net(Garmin Nuvi Forum) was issued (Wed )May 18th 2011. and the latest map update was issued (Thu) Aug 16th 2012 being (2013.20) i.e FIVE issues later.However please correct me if this information is wrong. Oops, that looks like an error on my part. The device came pre-installed with 2012.10. Because it has the latest map guaruntee you would be entitled to the latest version of the map when you register it, however as it is a review device I can't actually do all that! Sorry, and hope that makes sense? Thank you for your prompt reply.Yes ! That makes sense,but still strange that Garmin would designate a map update issued May 2011 as (2012.10). Many customers would assume that it was indeed a 2012 map and possibly not bother to register and claim their update. strange that Garmin would designate a map update issued May 2011 as (2012.10). Many customers would assume that it was indeed a 2012 map and possibly not bother to register and claim their update. That's the cynic in you coming out, but that's what sprung to my mind as well but quite how Garmin would gain by that, I'm not sure if they would.